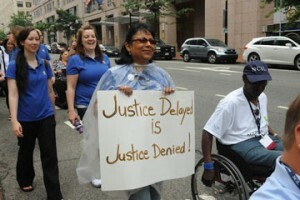 NCIL has been at the forefront for Transportation advocacy! The Transportation Subcommittee presented a position paper at the 2011 Conference and has diligently worked to implement many of the recommendations. One of those recommendations is outreach to the US DOT to create a relationship with them and get the issues and concerns of the NCIL membership addressed. That work has created a working relationship with many at US DOT. It has also provided an opportunity present to the NCIL membership a conversation with the department. This webinar is free to NCIL members, but registration is required. We encourage Centers to host group viewings! The link to register was provided in the October 3 edition of the Weekly Advocacy Monitor, a benefit of NCIL membership. The call / webinar will be hosted by the United States Department of Transportation. The moderator will be Richard Devylder, Senior Advisor for Accessible Transportation at US DOT and Cliff Perez, Chair of the NCIL Transportation Subcommittee. Invited guests include staff from DOT’s Office of the Secretary, the Federal Transportation Administration (FTA), Federal Highway Administration (FHWA), and the Aviation Office of Enforcement and Proceedings. On July 6, 2012 President Obama signed the Moving Ahead for Progress in the 21st Century Act (MAP-21) into law (P.L. 112-141).Funding surface transportation programs at over $105 billion for fiscal years (FY) 2013 and 2014, MAP-21 is the first long-term highway authorization enacted since 2005. Moving Ahead with Progress in the 21st Century (MAP-21). Topics include: Transit, Rural Transportation, Complete Streets, State of Good Repair, and Safety and Performance Measurements. For information, please contact Dara Baldwin at dara@ncil.org.